Tage, whose father was a farmer, was born and educated in the northern region of Liberia, and has a Bachelor degree in Theology and Educational Administration. He has spent many years developing community-based social enterprise and regeneration initiatives, and lists his professional skills to include teaching and counselling, educational administration, and pastoral care services, and currently serves as a Community Health Educator and Educational Advisor. Ruth trained as a Midwife and began training Traditional Birth Attendants before the war forced them to flee Liberia. Tage describes their passion, as the desire to see people and local communities developed and empowered to access positive change and improved quality of life, especially health-wise, through community-based initiatives and shared resources. He says, “People everywhere in the world, regardless of race, nationality or geographical location, are in the struggle for a positive change and quality of life”, and his vision is to be actively involved in helping to make this happen, especially in Liberia. 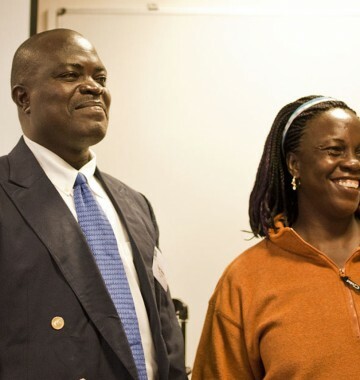 Tage and Ruth’s introduction to Lifeline Network International came about in 2004, a result of Tage’s relationship with our late partner, Richard Cole, with whom he worked in both Liberia and Sierra Leone. As a young man growing up under Richard’s leadership, they was closely involved in the early days of Lifeline Nehemiah Projects’ work in Freetown, and as a direct result of that connection, he eventually became our partner and national director of the work in Liberia. Together, their current work focusses on delivering improved community-based healthcare and medical services, especially in the area of maternal and child healthcare. This also includes a 10 room medical clinic, and plans are in place to expand and upgrade this facility to comply with health centre standards, including laboratory facilities, a child healthcare unit, a maternity unit, and an operating theatre. Plans are also being developed for a three bedroom guest house and an admin unit, and also to extend the existing training institute for maternity staff and laboratory technicians.